The only direct route to the Methvin’s that afternoon was going to be on the winding Highway 154 through Bienville Parish. The only straight stretch was south of Gibsland and a couple of miles beyond the Cole place. Just beyond Mount Lebanon, the road went downhill, then up a low rise. At the top of the rise, the roadsides had large amounts of brush and trees. On the east side, a steep hill was about ten or twelve above the road. From this vantage point, one could look north and see a car coming from close to a half mile away, but the people in a car were not able to see anyone in the brush atop the hill. 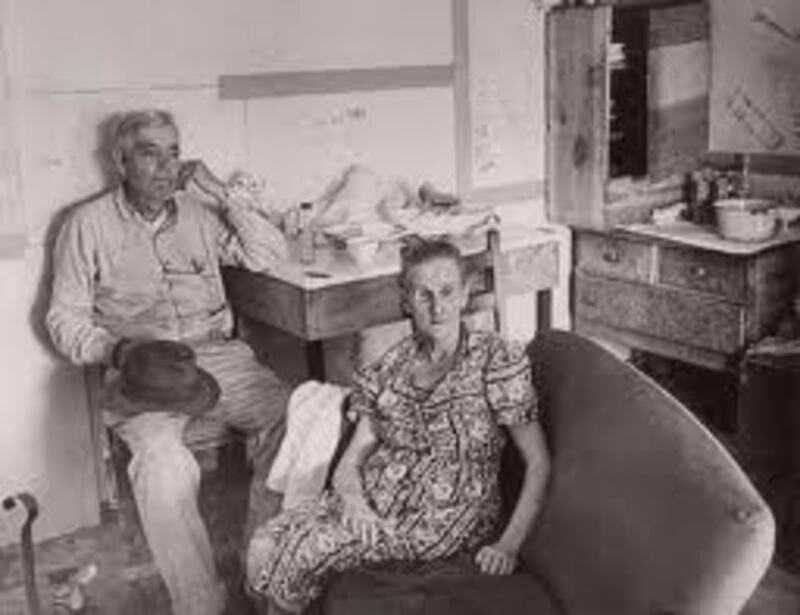 Since Sheriff Jordan was still trying to contact Special Agent Kindell, Clyde and Bonnie made it to the Methvin’s. Hamer and his group were also still in Shreveport instead of on the hill ready to attack. Henry wasn’t even at his parents’, he was staying with Cousin Willie. When Clyde and Bonnie drove up, Ivy met them outside, indicating that Henry wouldn’t be there until the next morning, and he should come back at 9. Clyde and Bonnie left, then Ivy went to Sheriff Jordan’s office in Arcadia to give him the new information. Jordan finally gave up on Kindell, and told Hamer what the plan was. Jordan and Deputy Oakley picked a spot on the road just south of Mount Lebanon, then everyone would rally and set up in time for the ambush to go down. It was discussed whether they should offer Clyde and Bonnie the opportunity to surrender, but Hamer knew he’d never give up. Since Clyde always drove fast, they didn’t think it would be possible to get a bead on them at 60 or 70 mph, let alone a perfect shooting angle. It would be necessary for Ivy Methvin to be there, standing beside his truck to get Clyde to slow down enough to accomplish the job. Jordan didn’t trust Ivy, fearing that he’d tell Clyde and Bonnie out of fear. Hamer was so confident for a success, that he called and told his son that he’d be home after 9 on Wednesday. The posse was at the site at 2 a.m. on Wednesday, the half moon provided next to no light, and the weapons were heavy, about 17 pounds for a BAR. They also had mosquitoes to deal with, and snakes on the ground. Hamer was going to be furthest south with a BAR, followed by Alcorn and Hinton, then would be Jordan, Gault and Deputy Oakley on the far north side. Gault and Oakley had Remington Model 8 .35 caliber rifles, which were designed for big game. Hamer also had a Remington Model 11 shotgun and a Colt Monitor Machine Rifle with a twenty shot mag. That was a serious piece of artillery. Hamer would step in front of the V-8, if necessary, to prevent Clyde’s escape, which would put him in the direct line of fire. Ted Hinton also happened to have a 16mm movie camera to record the aftermath. Someone also brought sandwiches and ice water. Jordan and Oakley were the only ones that had the power of arrest, if the need arose. As the sun rose, so did the number of mosquitoes, and the early morning humidity was very unpleasant. Ivy was there as ordered, but made it known that he wasn’t happy to be there. As soon as it was light, Ivy’s truck was positioned in the road, partially on the shoulder and pulled off the right front tire to suggest a blowout. As soon as Clyde and Bonnie appeared down the road, he was to hurry downhill and stand beside his presumably disabled truck. The early morning work traffic caused a bit of a snag, as most everyone stopped to see if Ivy needed help, and he’d have to go down the hill each time to explain that he had help on the way. Here Comes Clyde Barrow, Boys! 9 o’clock came and went. Finally, at 9:15, they heard a car coming from the north with a powerful purr. Then the gray V-8 came into view. Ivy hurried down the hill. The time was now. Clyde must have seen a truck with a familiar person in the road upon his speedy approach. There was also a huge logging truck heading north. There was no way that they were all going to fit on the same narrow section of road. The logging truck pulled off the side of the road to give Clyde the right of way, but he didn’t take it. He slowed, then stopped beside Ivy’s truck, leaving the Ford idling. 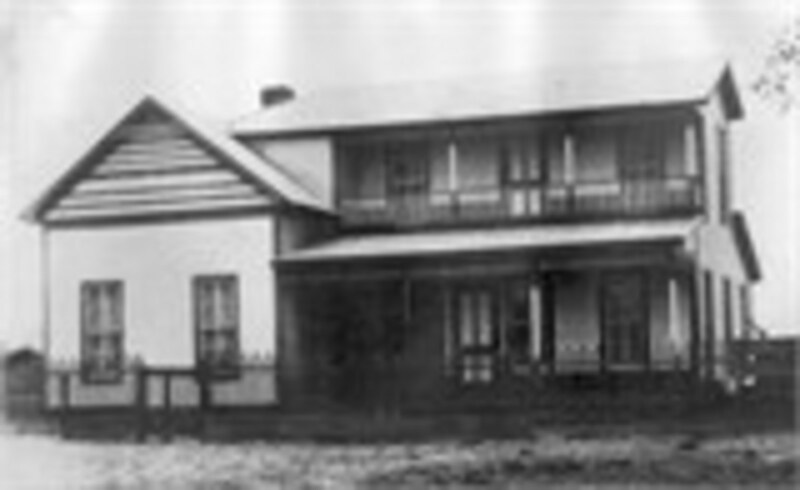 Before Hamer could stand and offer Clyde and Bonnie a chance to surrender, Deputy Oakley jumped to his feet, pointing the Remington down the hill at Clyde. Oakley squeezed the trigger and fired a burst at nearly a 45 degree angle, striking the post between the windshield and driver’s side door. One of the bullets struck Clyde’s head, exiting his skull. He died instantly. 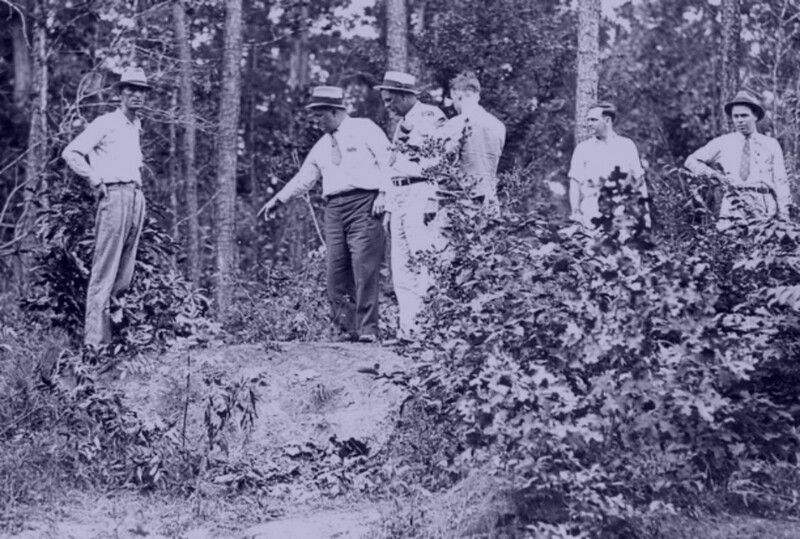 The Ford began moving ahead, two or three seconds elapsed, then everyone in the posse opened fire. 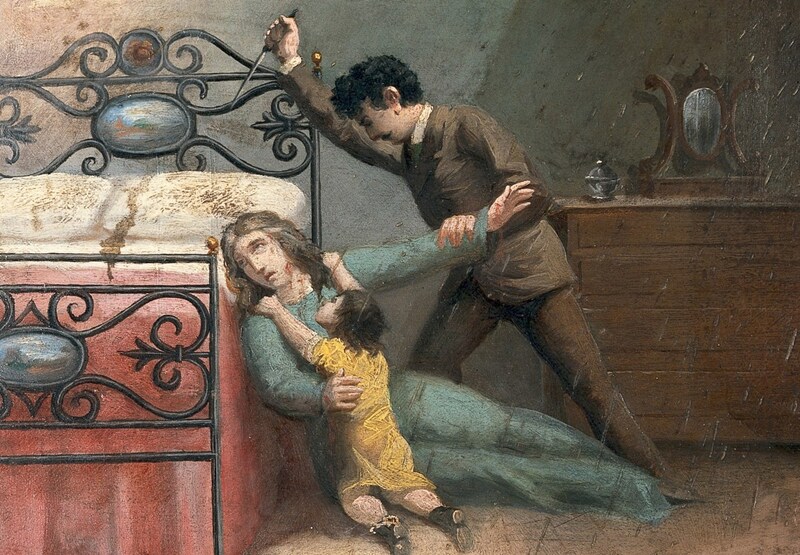 In those empty seconds, Bonnie screamed a high pitched wail that would haunt everyone like a banshee on a hot summer’s night for the rest of their lives. Bonnie’s “someday” was finally happening in living color. 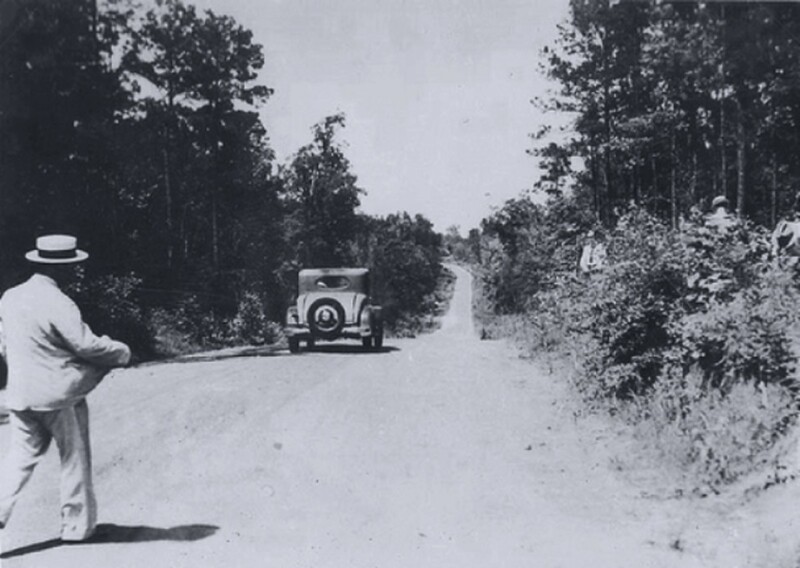 While the Ford rolled toward the ditch, Bonnie only had enough time to know that Clyde was dead, and she was next. Hinton later wrote that they fired about 150 shots. Many shots missed their quarry, but many did not. The concern about killing a woman went unchecked in the heat of the moment. Nobody had to worry about whether or not Bonnie was dead. Hamer hurried down the hill with the Colt Monitor Machine Rifle. 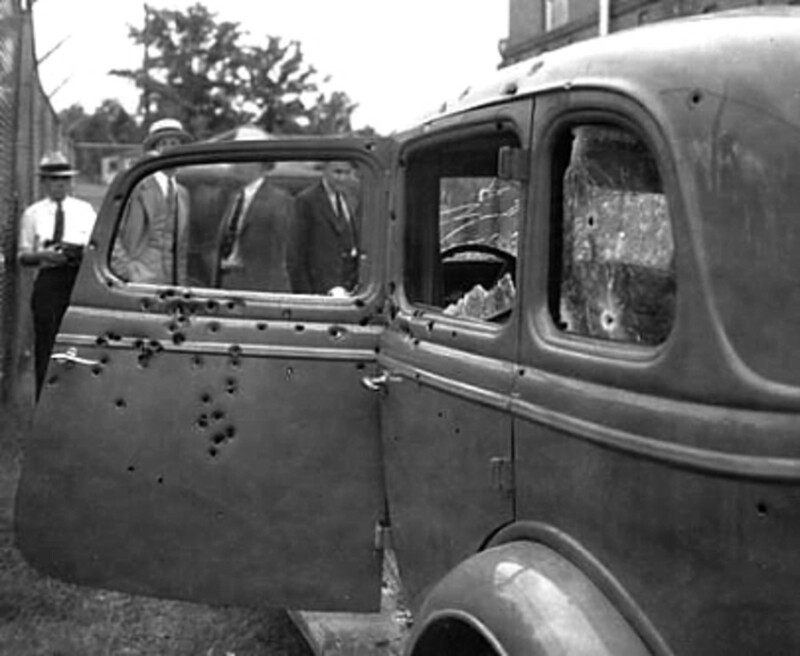 He was still firing at Bonnie, taking no chances, bullets going through the rear passenger’s window. He fired a final series of bullets through the window and windshield directly into her. Only sixteen seconds passed between the first and last shots. Though nobody could have survived this onslaught, the law officers were still cautious upon their approach to the car. It had been surprisingly quick and easy at the end, and Clyde and Bonnie never fired a single shot. 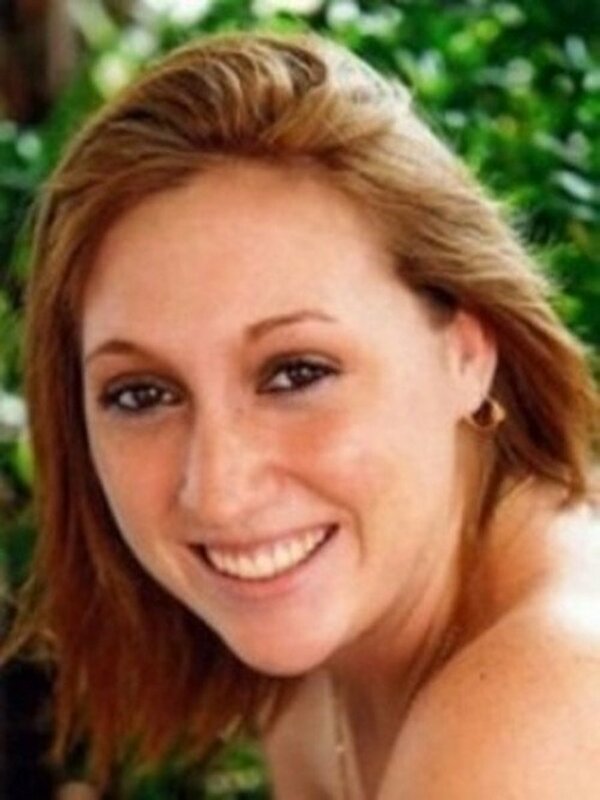 Ivy Methvin most likely had hidden under his truck during the ambush. The driver of the logging truck and his passengers nervously emerged from the woods. Ted Hinton made use of the movie camera, and residual gunsmoke was still in the air. Hamer conducted a quick inventory of what was in the back seat, but surprisingly, the money that Clyde’s father saw was gone…the family thought that Sheriff Jordan took that. 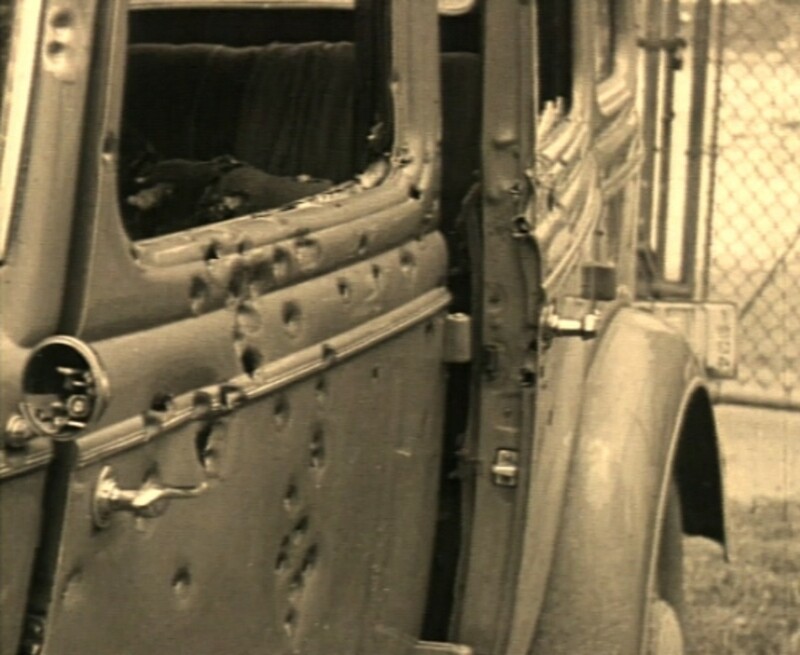 Many of Bonnie and Clyde’s former possessions were taken on site. Hamer told the press that they died with their guns in their hands, which was not true. It was a slaughter, for they had no time at all to react. Perhaps that was for the benefit of all the others that they had killed. 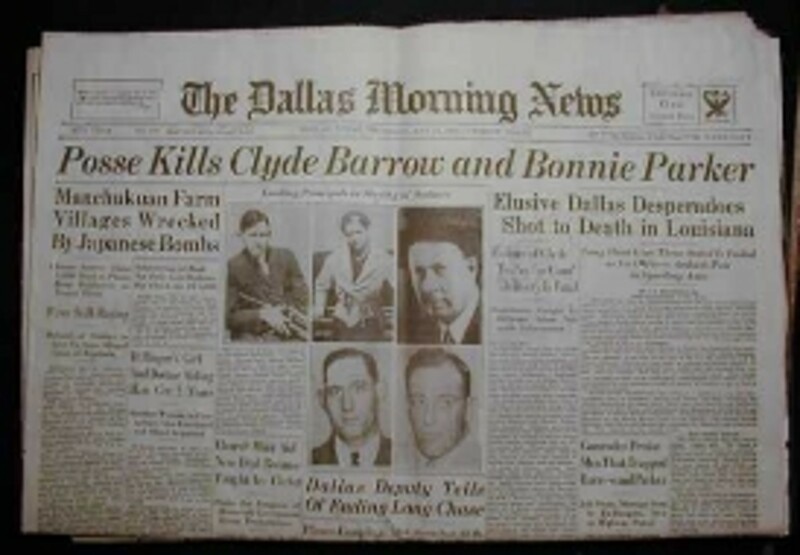 Bonnie got her ultimate wish that she go down with Clyde, so to her, that was all that would have really mattered. 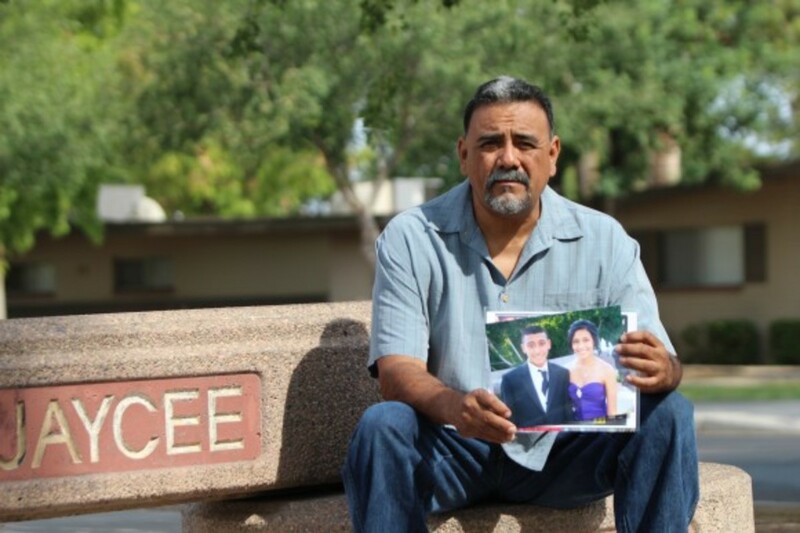 Their lives were over, but not their legacy. Karma catches up with everyone! My dad Cliff grew up in the same town outside of Dallas, Red Oak? I think it was called. The Barrows had a small store that my dads family used to buy goods from. It was called the Barrow General store I think. Thanks, epi! What an idea...I can do work on Canadian gangsters, too. Thanks for visiting, and I'll be seeing you in one format or another. In my book, diversity rules. Wow Deb there are more gangsters on your hubpage than in Washington these days (lol) and you have done such a wonderful world class job on Dillinger and Bonnie and Clyde here. Alicia, it was well worth it. It was one of the most interesting things that I have ever done. What we read in the history of our country was only a smattering of what these people were really about. The ' 30's were an interesting time, as the Depression brought forth a lot of things that this country was not proud of, but had to endure. Thank you for this very interesting series and for all the hard work that you did in creating it, Deb. Thanks, carol, it is great to see you. 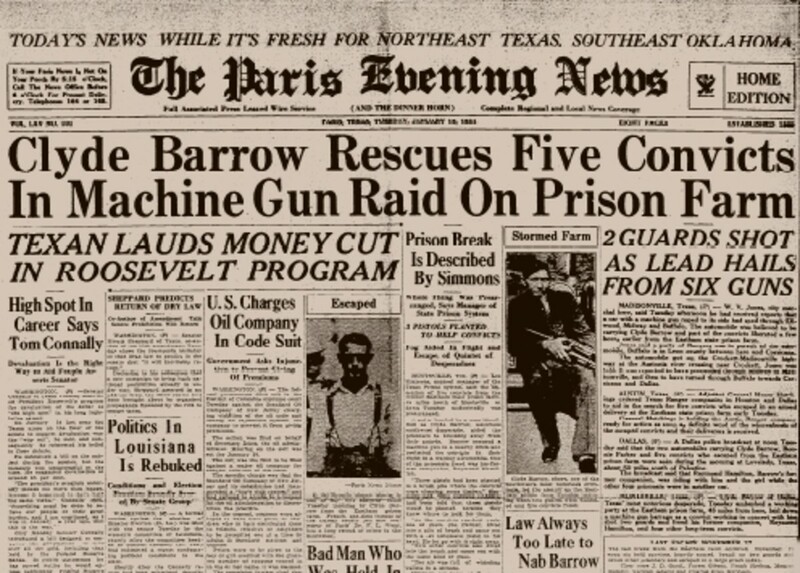 The Barrow Gang came through Oklahoma quite frequently. Thanks, Martin. Seemingly though, we would know that the inevitable was bound to happen sooner or later, and their capture, or death, was a lot later than what it should have been. Suhail, that move actually romanticized Clyde and Bonnie more than it told the actual story. Glad that you enjoyed it. I always enjoy reading about history especially such recent event.well in the scheme of things it is. You did a great job and made it most interesting to read. You did your homework. As I said earlier, this series brought me too close for the known conclusion. Not your fault. You did an outstanding job. Thank you. Very well presented. Hats off to you. Reminded me of Warren Beatty and Faye Dunaway movie of 1967 that I only saw sometimes in the 80s. Yes, Jim. With the element of surprise, nobody else died, which you know would have occurred. What a bloody end to a crazy life for those two. Giving them a chance to surrender would have had the same result, perhaps with some dead lawmen as well, I'm sure. Great series of articles on this story. Thanks, Billy. It was fun to do, too! This was a fantastic series, Deb! Great research and wonderful delivery. I really enjoyed it.